This is Valentine’s Day, February 14, 2011. I like the holiday only because I have someone who buys me cards and wishes me a happy day……and yes, this person loves me. I did not like it when I was single. I have a friend who used to go out with me on the evening of Valentine’s Day. It seems we were always dressed in a depressing manner….you know, lots of black and other dark hues. We would sit in a random bar/restaurant and moan, groan and laugh at all the couples who were together for this special night. Love, who needs it. We were jealous! So now that I have someone special in my life, we always try to go out with our single friends on this special day so that they aren’t left by themselves to make fun of any couple who ventures out to express their affection. Anyway, hecklers tend not to be in fashion on this special day of love. So this morning, I asked myself where did this idea of a special day get its beginning? Is there such a person as St. Valentine? A little research across the web and, low and behold, a history I obtained from Yahoo Buzz that I thought you might enjoy. “So how was Valentine’s Day created? Who was St. Valentine? Was he a great lover a la Casanova? Was he even a real person? 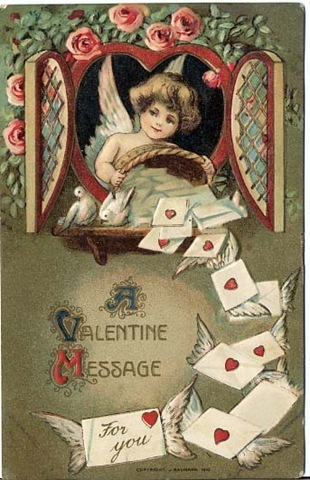 According to Catholic Online, St. Valentine was very real, but he probably wasn’t a smooth operator with the ladies. “Valentine was a holy priest in Rome, who, with St. Marius and his family, assisted the martyrs in the persecution under Claudius II.” For his trouble, Valentine was beaten and then executed after authorities were unable to get him to renounce his faith. His death occurred on February 14. As with many events that occurred so long ago, other theories abound. Indeed, there were several different Valentines, and nobody is 100 percent sure which one was which. Some believe he was a priest, others believe he was a bishop, some believe he was a combination of the two, and still others believe he was someone else entirely. All that said, there is little doubt among experts that Valentine did exist in one form or another. So today, if you are frantically searching for flowers, a box of candy or sitting at a bar/restaurant looking to sneer at anyone who looks romantic, remember….it’s all thanks to the one and only St. Valentine, whoever he was. I loved the story. I am sure many others did as well. Can”t wait to read your next blog. Thank you so much. More is coming.